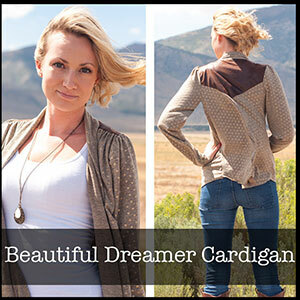 The Beautiful Dreamer Cardigan is an open front cardigan with soft drape, gathered shoulder, and back yoke detail. Designed to softly drape and frame the body. Comfort and style all in one. Suggested fabrics are light to medium weight knits such as cotton jersey, cotton lycra, hacci sweater or ponte de roma. 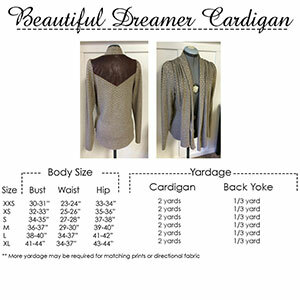 For the back yoke try one of our specialty wovens or faux vegan leather.